Mahabharata | Art of Living, Sri Sri Ravi Shankar and My Self! I love reading stories. I think stories are the best form of parting knowledge and wisdom to anyone. One of the ideas I had for this blog was to tell the untold stories from the hindu mythology and its interpretations. I was asking a friend of mine to start a blog to tell stories of with her take on it when I realized that I dont have any stories in my blog. So here is a beautiful unknown story from my favorite epic – The Mahabharata; favorite subject – Karma; favorite character – Karna or Radheya. His story is a unique one with topcis like friendship, dharma, compassion and charity moulded together. he was known for his charity through out the Mahabharata. He kind of sacrificed his life even before the war just for his friendship towards Duryodhana by giving away his “born with” armor and earrings. Though he knew that his side would loose the war, he still fought for his friend on the wrong side. I read somewhere that he had a blessing that anyone who read about true story would have a special liking for him. He was a HERO, the most powerful one, the bravest and yet the most tragic warrior of the Mahabharata. He was the son of the Sun god, Surya. 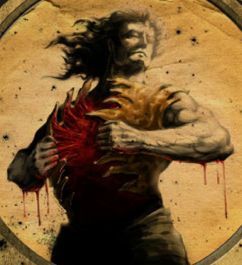 Not many know about the real story of Karna- who he was in the previous life, how did he get the armor and why did he have go through so much of pain. 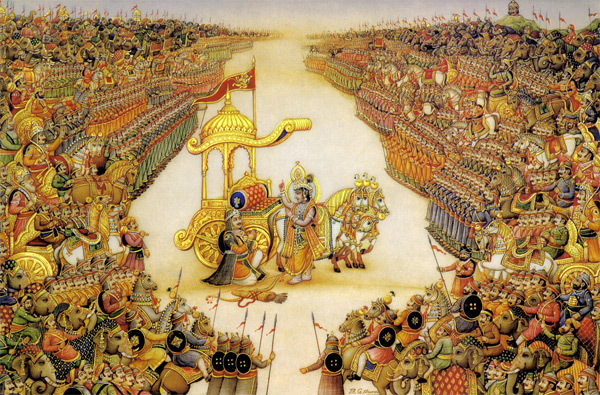 It is a fascinating tale which is very closely tied to the birth of Lord Krishna and Arjuna. Read it below and enjoy! Long long ago(my favorite line in any story! ), even before the Mahabharata, there lived an asura(demon) named Dambhodbhava. He wanted to become immortal and so prayed to the Sun god, Surya. Pleased with his penance, Surya appeared before him. Dambhodbhava asked Surya to make him immortal. But Surya couldnt grant this boon since anything, anyone who was born on this planet will have to die. Surya offered him to ask for something else instead of immortality. Dambhodbhava thought of a different way to gain immortality and came up with this request. Surya was horribly worried. He knew that Dambhodbhava had performed a very powerful penance and that he could get the entire boon he had asked for. And Surya had a feeling that Dambhodbhava was not going to use his powers for good. 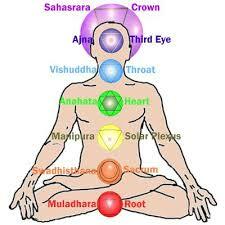 However having no choice in the matter, Surya granted Dambhodbhava the boon. But deep down Surya still admired Dambhodbhava for the devotion with which he prayed to him. Immediately after getting the boon from Surya, Dambhodbhava started wrecking havoc on people. People were scared of fighting with him. There was no way of defeating him. Anybody who stood in his way was crushed by him. People started calling him Sahasrakavacha [meaning one who has a thousand armours]. It was around this time that King Daksha [the father of Sati, the first wife of Shiva] got one of his daughters Murti married to Dharma – one of the ‘Mind’ sons of Lord Brahma, the God of Creation [It is said that Lord Brahma created his mind sons or Manas putras from his thoughts]. ‘I am pleased with your devotion! I will come and slay Sahasrakavacha! Because you have prayed to me, you would be the reason for slaying Sahasrakavacha!’. Murti gave birth to not one child, but twins- Narayana and Nara. Narayana and Nara grew up in the ashrama surrounded by the forests. They enjoyed praying to Lord Shiva. The two brothers learnt the art of warfare.The two brothers were inseparable. What one thought the other was always able to finish. Both of them trusted each other implicitly and never questioned the other. Sahasrakavacha faced the attack of Nara and was astounded. He found that Nara was powerful and had indeed got a lot of power from the penance of his brother. As the fight went on, Sahasrakavacha realized that the penance of Narayana was giving Nara strength. As Sahasrakavacha’s first armour broke he realized that Nara and Narayana were for all purposes one. They were just two persons having the same soul. But Sahasrakavacha was not too worried. He had lost one of his armours. He watched in glee as Nara dropped dead, the minute one of his armours broke! As Nara fell down dead, Narayana came running towards him. By his years of penance and pleasing Lord Shiva, he had gained the Maha Mritunjaya mantra – a mantra which brought back dead to life. Now Narayana took the fighting with Sahasrakavacha while Nara meditated! After thousand years, Narayana broke another armor and dropped dead while nara came back and revived him. This went on until 999 armors were down. Sahasrakavacha realized that he could never beat the two brothers and ran away seeking refuge with Surya. When Nara and Narayana approached Surya to give him up, Surya did not since he was protecting his devotee. Nara cursed Surya to be born as a human for this act and Surya accepted the curse for this devotee. All this happened at the end of Treta yuga. [In Hindu mythology there are four yugas – the Satya Yuga, the Dwapara Yuga, Treta Yuga and the Kali Yuga. Each Yuga steadily results in the deterioration of human values with the worst in the Kali Yuga. At the end of each yuga, nature starts afresh.] Immediately after Surya refused to part with Sahasrakavacha, the Treta Yuga ended and the third Yuga started. To fulfil the promise to destroying Sahasrakavacha, Narayana and Nara were reborn – this time as Krishna and Arjuna. Due to the curse, Dambhodbhava and Surya together were born as Karna, the eldest son of Kunti! Karna was born with one of armours as a natural protection, the last one left of Sahasrakavacha. As Arjuna would have died if Karna had had the armour, Indra [Arjuna’s father] went in disguise and got the last armor of Karna, much before the war began. As Karna was actually the monster Dambodbhava in his previous life, he led a very difficult life to pay for all the sins committed by him in his past life. But Karna also had Surya, the Sun God inside him, so Karna was a hero as well! It was Karna’s karma from his previous life that he had to be with Duryodhana and take part of the all the evil things he did. But the Surya in him made him brave, strong, fearless and charitable. It brought him long lasting fame. THere are many many stories about Karna in the Mahabharata which are heart rendering, touching but also sometimes evil and wrong. This was because of the conflict of the qualities of a deva, Surya and asura, Sahasrakavacha in him. This reminds me of the conflict in all of us. Sometimes we do good but sometimes we take to the other side. Everyone has got these both qualities inside them – the godly qualities and the animalistic ones. How we tame the animalistic qualities and let our good ones spread determine how “good” we are. The other thingI got from the story is no matter what the situation is there is always a way out – sometimes it takes just one to get there and sometimes two- like Nara and Narayana. The one question that was unanswered for me was -how did Sahasrakavacha die in the first place to be reborn? He still had one more armor to go and was protected by Surya! Well, I couldnt find this answer anywhere. I hope you enjoyed reading this long story of Karna! Thanks to http://hindumythologyforgennext.blogspot.com/ from where I was able to read this story!